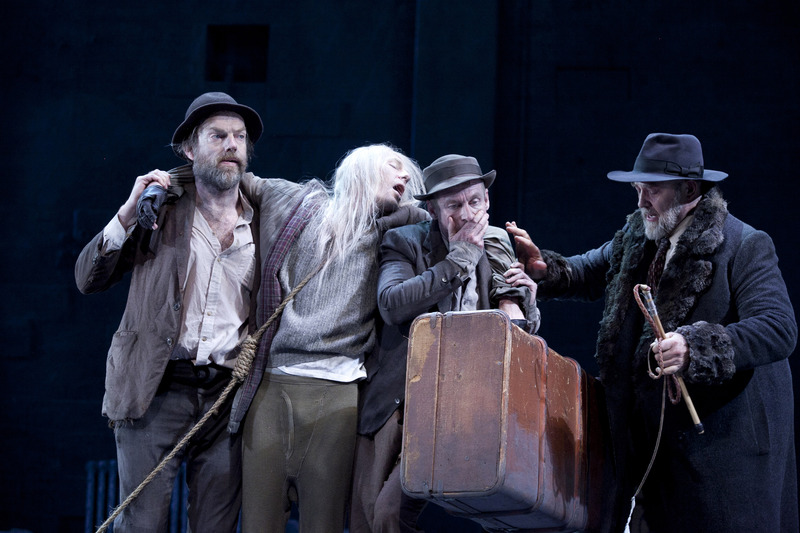 SYDNEY Theatre Company’s Waiting for Godot offers, above all, the grace of tenderness and the gift of generosity. There are few qualities more touching in any circumstances; in Godot they temper and illuminate one of the harshest and most unforgiving dramas of the 20th century. Life is envisioned as a cruel paradox. We can have hopes for the future but can possess no knowledge of it. This is for the best, of course. If we had the power of foresight all hope may well be extinguished and with it the desire to go on. No matter how unendurable the present is, it will be endured. Memory – the only way in which we can know ourselves – may possibly sustain us, but is deeply unreliable. The only questions are these: If one must go on, how is progress through space and time to be achieved? If events are out of our control, what things are within reach? If perception of the past isn’t to be trusted, is the present micro-second of consciousness – the “right now” – the only sliver of time that has any value? Essentially the manner in which we face the void comes down to character, intellect and will. The hours will pass quickly, or slowly. They will be filled with activity that gives pleasure, or not. Actions will be taken, or avoided. There will be co-operation, or subjugation. All these things will be subject to change. It’s not so much what’s done that is important, but how it is done. This production, directed by Andrew Upton with Anna Lengyel as co-director, takes as read the great abyss that lies ahead and places its faith in the many small gestures of connection – touches, glances, interactions, diversions – that bind one person to another in the here and now. Being in extremis is one thing. To face it alone would be the greatest horror. This truth is encapsulated briefly in the most affecting way. The second act of Godot brings a bitter expression of despair from Pozzo, seen in Act I as a monster of brutality and self-satisfaction but now blind and diminished. For a few seconds, though, he is roused to rage and then grim summation. “They give birth astride of a grave,” he says, “the light gleams an instant, then it’s night once more.” He has to move on with Lucky, his “menial”, once more weighed down with Pozzo’s belongings and attached to his master by a length of rope. But before they go Lucky, who has been so sorely abused by Pozzo, takes out a handkerchief and gently wipes his tormentor’s face. Pozzo has earlier called Lucky “my good angel”, and in Luke Mullins’s radiant performance Godot has just that. For me this is the production’s key image. Upton doesn’t go soft on the play, as that gesture may imply. He and an unimprovable group of actors delve into the core of the matter and find a persistent spark of humanity in the midst of desolation. Hugo Weaving’s Vladimir and Richard Roxburgh’s Estragon are in a constant, restless state of anxiety, that much is clear. Vladimir just manages to hide it a little better. He is the one with carrots and radishes about his person when Estragon complains of hunger. He is the one insistent on meeting the obligation to Godot as a matter of honour. His speech is carefully chosen for rhythm and ever so slightly heightened effect. “For the moment he is inert,” Vladimir says of the prone Lucky. Weaving’s locution is resonant and precise but his tense jaw, mobile mouth and wandering tongue give the lie to his apparent command of the situation. Estragon is the more obviously untethered and in need of protection, although there is much sweetness in his expression and his eagerness to please. Roxburgh has a rare gift for being simultaneously heartbreaking and funny (his Vanya in 2010 was superb) and you could pick scores of examples from Godot. My favourite was the reassurance of Philip Quast’s magisterially blood-and-thunder Pozzo in the first act as he trawls for compliments after some speechifying – Pozzo claims he may have weakened slightly near the end. Roxburgh’s Estragon is quick to oblige, without the slightest hint of sarcasm. “I thought it was intentional,” he says, keen to win favour. Despite Godot’s extreme artifice Weaving and Roxburgh have a lightness of touch that borders on naturalism. This makes for a fascinatingly multi-layered production in which the poetry of the play is honoured but can sound conversational and the overt theatricality is absorbed seamlessly into an easy flow of banter and time-filling. The routine in the second act in which Vladimir and Estragon swap hats, for instance, has nothing of the presentational music-hall performance style so often seen and becomes something much less contrived. The easy rapport between the two men (as actors and characters) trumps party tricks. There are funny sad bits and sad funny ones, just as in life. Finally, let us give credit where it is overdue. It was Irish critic Vivian Mercier who, in 1956, wrote of Waiting for Godot that “nothing happens, twice”. It’s hard to find a review that doesn’t reference that rigorous, economical phrase, although rarely with attribution and frequently with lack of understanding. [Waiting for Godot] has achieved a theoretical impossibility – a play in which nothing happens, that yet keeps audiences glued to their seats. What’s more, since the second act is a subtly different reprise of the first, he has written a play in which nothing happens, twice. “Theoretical impossibility”. Godot is the perfect expression of such a state, with its reliable unreliability of memory, the unendurable that must and will be endured, the nothing happening that takes close to three hours in the theatre to perform, and the constant tension between that which is said and that which is apprehended or done. Waiting for Godot runs until December 21. This entry was posted in Theatre and tagged Andrew Upton, Anna Lengyel, Hugo Weaving, Luke Mullins, Philip Quast, Richard Roxburgh, Sydney Theatre Company, Vivian Mercier by deborahjones2012. Bookmark the permalink.